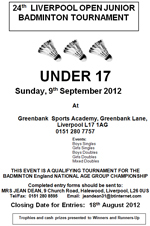 The 24th Liverpool Open Junior Badminton Tournament will be taking place on Sunday 9th September 2012 at Greenbank Sports Academy. The tournament is split into two age groups: under 15s and under 17s. Please see below for the entry forms. Note that the deadline for entries is 18th August 2012.